With a Curb Alert PRO™ parking sensor, you’ll no longer have to worry about damaging your vehicle’s front bumper when pulling up to or leaving a curb, or approaching the end of a steep driveway. Using Infrared LED technology, the Curb Alert PRO™ curb sensor will reliably detect when you are getting too close to a curb and warn you with a short series of audible beeps, preventing expensive damage to your vehicle. 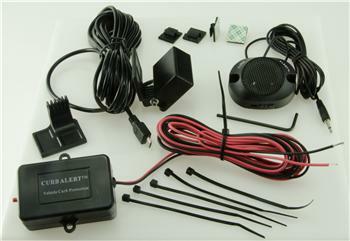 Curb Alert PRO™ is a patent-pending curb detection device that uses the latest in Infrared LED technology to determine the distance of your vehicle from a curb or other low obstacle. It sends out infrared waves that are analyzed by the system to determine how far your vehicle is from the curb. If it determines that your vehicle is dangerously close to the curb, it alerts you with an audible in-cabin tone to prevent damage to your front bumper, spoiler or valence panel. Housed within a weatherproof case to handle any weather conditions thrown at it. Curb Alert PRO™ is an invaluable and easily installed addition to any vehicle with a low front end, from a sports coupe to a hybrid. It’s happened to all of us. You pull up too close to a curb and you hear that ominous “SCRAAAAPE”. Sometimes, you’ll remember to pull away slowly when you return and avoid further damage. But if you drive a sports car, or sports sedan, or any vehicle with a low front end (even a Prius, for example), you can “hook” your lower fascia and experience one of the worst automotive emotions possible – backing up and having the curb rip your lower valence panel or even your entire fascia from the car! It happens every day, to innocent drivers, which is exactly the core frustration for the Corvette owner and Curb Alert PRO™ inventor who approached us and asked us to help him commercialize his new invention. We thought it was clever, and useful. When we showed it to friends and family and the reaction was overwhelming – Why hasn’t someone thought of this before! ?